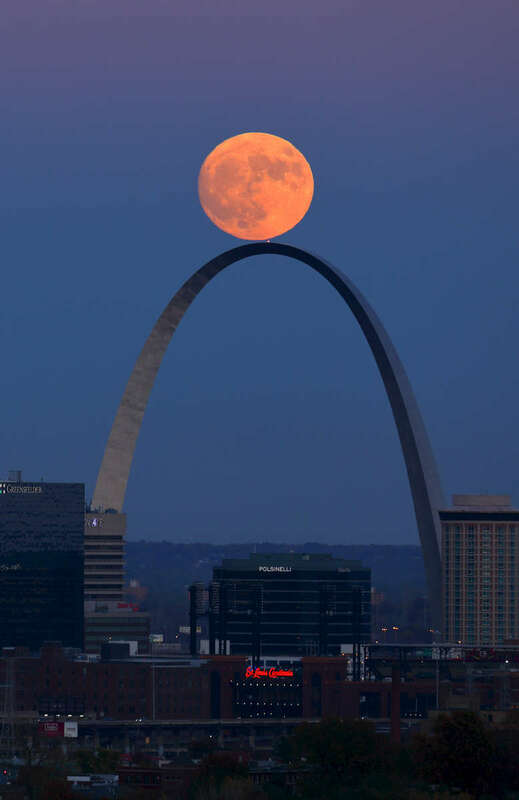 The supermoon rises over the Arch in St. Louis as seen from the Compton Hill Water Tower on Sunday, Nov. 13, 2016. The supermoon will peak on early Monday morning shortly before sunrise, it will be the nearest supermoon in almost 70 years and will be the largest until Nov. 25, 2034. A supermoon happens when a full moon makes its closest pass to Earth appearing up to 14 percent bigger and 30 percent brighter in the sky. Viewing of the moon should also be good on Monday after the sun sets and the moon rises out of the east.